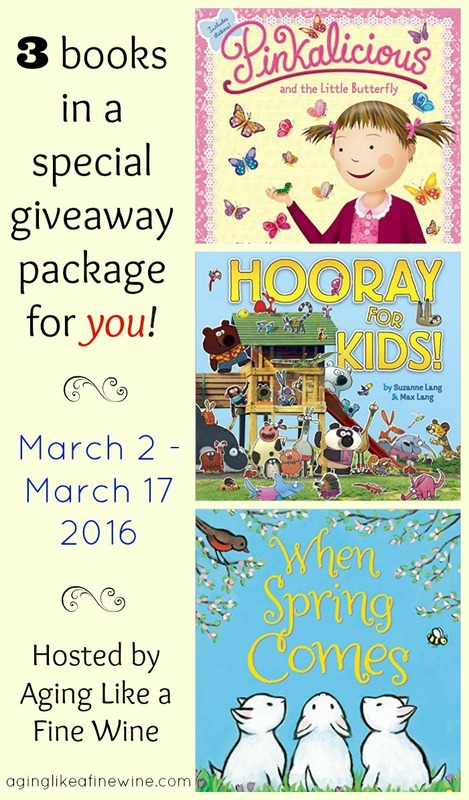 3 fun new children’s books in a giveaway package for you! 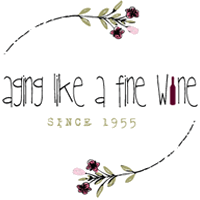 In this techie world we live in, I fear that we are losing the importance of reading to our children and grandchildren because let’s face it, a lot of times they would rather play video games or watch something. And when Mom and Dad are tired at the end of a busy day it’s sometimes easier to just give in. We need to instill a love of reading in our kids and the best way to do that is by reading to them when they are young. Reading opens up new worlds and allows our children’s imaginations to soar! 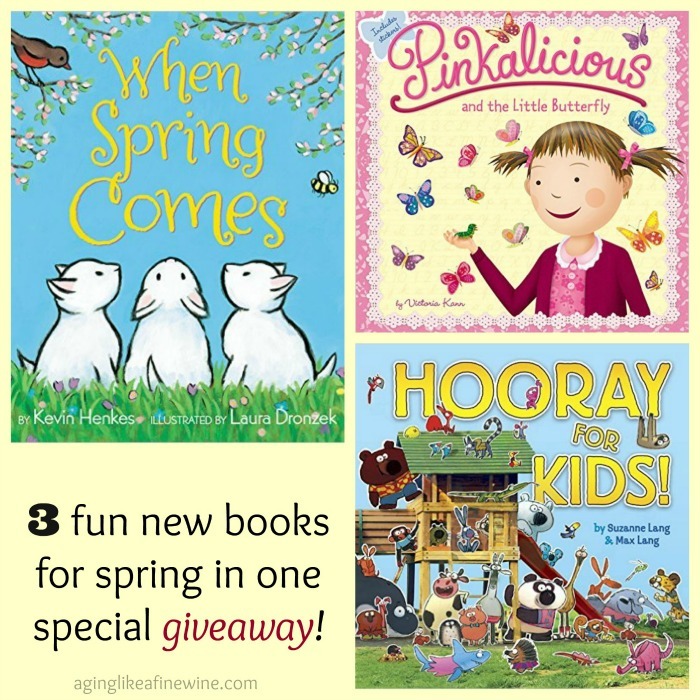 March is National Reading Month so there couldn’t be a better time than this to offer a giveaway of 3 new children’s books. I received these books as a gift (I received no remuneration for reviewing them) and now I want to offer these 3 books to you in a giveaway package. Pinkalicious is back with a new story about a tiny caterpillar that turns into a beautiful pink butterfly! What little girl doesn’t love pink, right? This newest book will not disappoint. The story begins to unfold as Miss Penney brings caterpillars to school for the children to observe and learn about their amazing transformation into beautiful butterflies. One little caterpillar is special to Pinkalicious and holds a special surprise! This book is made even more special by the addition of stickers! Written by Kevin Henkes and illustrated by Laura Dronzek. This delightful little book makes us yearn for spring as we watch the world transform from the cold, dark winter to the bright and colorful spring! The characters are animals and children and the paintings of Laura Dronzek provide a beautiful illustration of the transformation of seasons. Written by Suzanne Lang & Max Lang. This joyful book leads us on a journey to celebrate kids of all ages and the differences between them. The story zips along in a sing-song rhyming fashion with many different animals playing the role of children. The book encourages our children to accept others, differences and all! Just complete the entry form below for a chance to win! It is so important to read to your child. My grandson is in the first grade and I’m amazed at how well he reads. He has had books read to him since birth. It makes a huge difference. I agree, it does make a huge difference both in their ability to read and their desire to read. Reading is knowledge! I love Harry Potter! My son loves the movies and I can’t wait for him to get into the books! We would love to see them choosing to read over watching television or playing video games, wouldn’t we. I hope your son will start reading the books again soon. My grandchildren also loved “Good Night Gorilla”! I really like all children’s books. Dr Seuss, Pete the Cat, Pinkalicious. My kids have a ton of stories to choose from so story time is never boring. That’s wonderful, I’m so glad to hear that and that you read to them! My 2 year old daughter loves to read books and loves it when I read to her. My favorite book would have to be the Going to Bed book by Sandra Boynton. She is so creative and my daughter and I laugh as we read it. I’m happy to hear that she loves to read. Obviously you have fostered that love in her; that’s wonderful! I will be putting a new book giveaway up this week and it will include “How to Put Your Parents to Bed”. Cute book! Great, I will giving away a Pete the Cat book in an upcoming giveaway! That is a cute book! My grandchildren and I recently heard it at storytime! Very popular book series! We have one in an upcoming book review! My girls LOVE the Pinkalicious books! Wonderful series for little girls. Good luck with winning this one! My favorite childrens book is Big Sarah’s Little Boots! I haven’t read that one. My interest is sparked, I will look for it at the library! I have always loved Amelia Bedelia books. I have a 9 month old now and read to her all the time. I hope to make her love books as much as I do! I truly believe that reading to her will accomplish that. I’m a librarian and love children’s books. I have always liked the Berenstain Bears. They were my son’s favorites and now are one of his children’s favorites! It is loved by many! we are reading to 20 month old Nicholas every day and many times on the weekends. I believe it is very important to read at a young age as it gives them a sense of reading all the time instead of tv. I agree with you. I believe too that even if they stop reading quite as much as teenagers, they will return to their love of reading as they grow a little older and wiser! We love pinkalicious- can’t wait to read the others! Pinkalicious is a favorite of many. Good luck! His birthday was just celebrated! My daughter loves the alphabet dictionary books, as she can see many different things in same book. She isn’t patient enough for me to read a story yet, so these books work really well. My granddaughter also like those and wanted to look at them over and over when she was younger. James and the giant peach. I love to reead to my daughter. Good for you Robert, you will always be glad that you did. Isn’t it fun to share books with our grandkids! We grew up with Little Golden Books but one of my favorite was Huey , Duey, and Luey. Because they were always getting into trouble but they didn’t mean too. I have two sisters and we are very close in age. And even though we fought like cats and dogs. We had each others backs. Little Golden Books, a great childhood memory! I have 3 sisters as well and we definitely did our fair share of fighting. Now they are my best friends! My favorite children’s book is I love You Forever. Sweet book about a mother’s love! Like you, I really like the old school Winnie the Pooh! Isn’t he special! He has brought laughter to generations of kids!